1. You warrant that your dog is fit, healthy and up to date with all necessary vaccinations. 2. The grooming of elderly dogs is undertaken entirely at the owners risk. Grooming may expose underlying skin or health problems that Julie Earith T/A Dapper Dogs cannot be held liable for. 3. 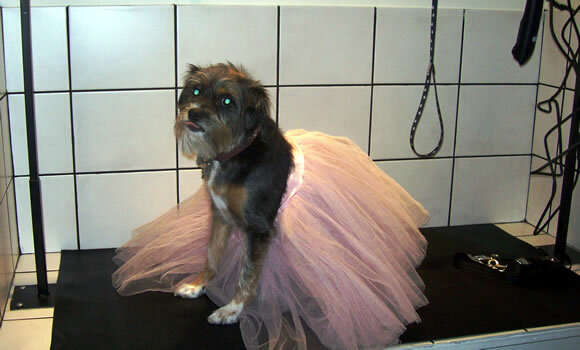 If we feel that de-matting your dog would cause too much stress and discomfort we may recommend a complete clip down. This will dramatically change your dog’s appearance as their hair will be short and close to the skin. A complete clip down may expose pre-existing skin conditions such as hotspots, sores, parasite infestation, urine and faeces scalding, fungal, bacterial and yeast infections. If these are detected we would recommend you seek immediate advice from your vet. 4. The dog owners should maintain their dog’s coat in between regular grooming appointments (every 6-8 weeks). Dogs with extremely matted coats will be charged extra. 5. Julie Earith T/A Dapper Dogs is committed to giving every care and attention to your dog, but please note they are accepted at the owners risk. 6. Our first concern is for the welfare of your dog so in the event of injury or illness we may call a vet and unless it can be clearly shown that Julie Earith T/A Dapper Dogs are liable, all costs in connection with and in the carrying out of this instruction shall be at the owners expense. We therefore recommend you take out adequate dog Insurance. 7. Under no circumstances do Julie Earith T/A Dapper Dogs accept sedated dogs. 8. Owners are requested not to feed their dogs in the 2 hours prior to their appointment and ensure their animals are toileted. A dog with a stomach full of food and a full bowel/bladder will find the grooming process very uncomfortable. Julie Earith T/A Dapper Dogs charge for the additional time and cleaning materials required in cleaning up after your dog. 9. Payment must be made on collection of the dog. Owners are requested to collect their dogs at the time stated. Julie Earith T/A Dapper Dogs do not offer a dog sitting service nor are we insured to do so. Julie Earith T/A Dapper Dogs will charge an additional fee in these circumstances. 10. If you arrive more than 15 minutes late for an appointment, without contacting us, then we may have to reschedule your slot and reserve the right to charge a cancellation fee. 11. It is a requirement that you advise us prior to your appointment if your dog has any medical conditions, is taking medication prescribed by a vet and any other information which could help us provide a stress free dog grooming service for your dog. WE MAY REFUSE TO GROOM DOGS THAT PRESENT A RISK OF INJURY TO THEMSELVES OR STAFF.